I noticed the calm as soon as we got out of the taxi. Even though it was after 10:00 in the morning, there was almost no traffic on the street. We split the cab fare with Lucy and Glenn, an Australian couple we met at the border, said our farewells, and we picked up our packs and started walking. A few motorbikes and tuk-tuks would putter by, and a few more foreigners were sitting in the sidewalk cafes drinking coffee while pouring over Lonely Planet guides. Peace reigned over all. 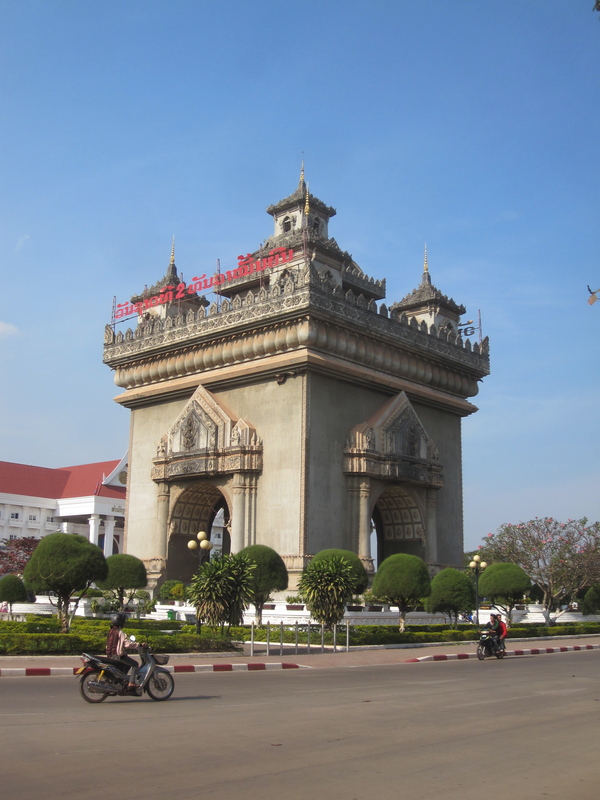 It was hard to believe we had just arrived in Vientiane (pronounced VEE-en-chan), the capital of Laos and its largest city. Our trip to Vientiane was easy, if long. 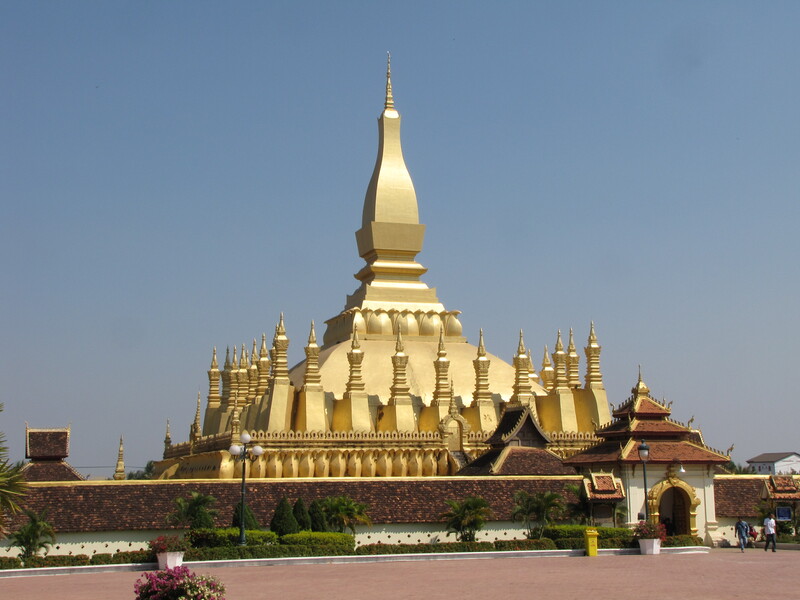 We were able to get from the gulf coast of Thailand to Vientiane, the capital of Laos in about 24 hours by a combination of bus, overnight train, tuk-tuk and taxi. Although there were a lot of moving parts, it was a pretty easy trip. We ended up at our guesthouse in Vientiane even earlier than we thought. We got checked in, showered off the grime of the trip, then hit the street for croissants and Lao coffee. Even decades after the end of French rule in Laos, the French culinary tradition remains in Vientiane. I wouldn’t be a bit surprised if Vientiane didn’t have the best croissants in Asia. Vientiane’s small town feel is not just the illusion of a sheltered tourist district tucked away within a larger, screaming metropolis. Even when venturing beyond the outer limits of the city center, you still find no one in much of a hurry. You rarely hear raised voices or car horns. Nearly every corner of the city has a wat, peaceful Buddhist temples and monastery complexes that seem to emit their inner calm to the rest of the city. Even the tuk-tuk drivers are relaxed. Every now and then, one will pop up from his seat with “Sabai dee! Tuk-tuk?” At least as often, we would find a tuk-tuk driver asleep in a hammock made just to fit across the frame of the tuk-tuk’s shell. Just about the only reason to leave Vientiane is the Buddha Park, located about 25 kilometers to the south of the city. We crammed on to public bus #14 at the Talat Sao bus station for an hour-long ride to the park. When we arrived, we found a park maybe an acre or two large full of large, and often bizarre, representations of the Buddha and various Hindu deities. The centerpiece is a colossal reclining Buddha statute that is at least 50 meters from end-to-end. When wandering around the rest of the park, however, we had the feeling of having gone down the rabbit hole. Vientiane lacks the energy of Bangkok and the chaos of Delhi, and I think that’s why we loved it so much. What it lacked in excitement, it more than made up in good food, interesting sights and friendly people. Patuxai. I’m missing the Arc d’ Triomphe comparison. There is a career to be made in Asia (except Japan) for grammatically correct sign translation. 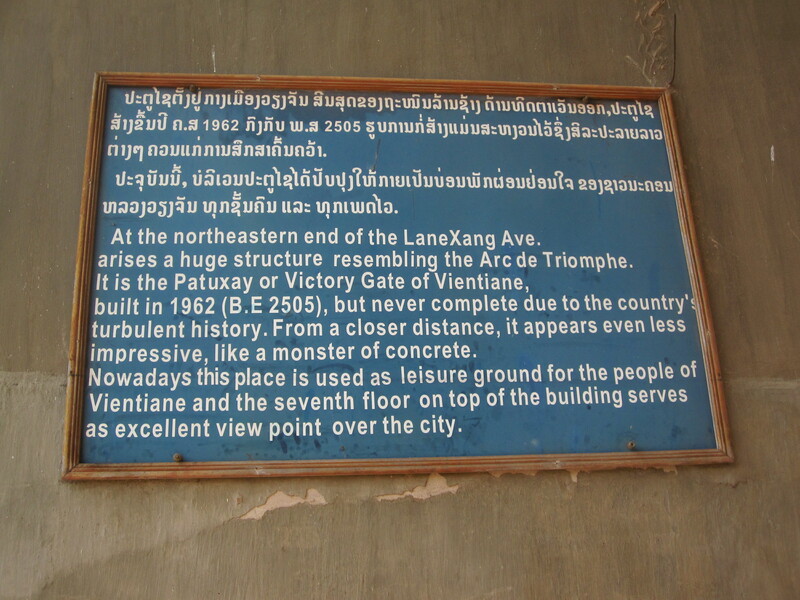 Nice write up on Vientiane. I have been there a couple of times since 2007 and I agree, the people, food and sights are what really makes this city a wonderful place to visit.